1. I have a private board where I am bookmarking higgledy-piggledy the sundials that I might want to use. This is actually better than bookmarking in Diigo because I need the VISUAL cue provided by the image as I go back through what I have bookmarked and select the item I want to work on. I am keeping the board private because I am bookmarking CC-licensed images as well as images that are not CC-licensed; eventually I may decide to contact the copyright owners of those non-CC-licensed images to see if they will give me permission to use their images in a blog post. So far, though, I have plenty of CC-licensed material to work with. 2. I then created a public board for Latin sundials, and as I add new blog posts, I also pin them to the board. 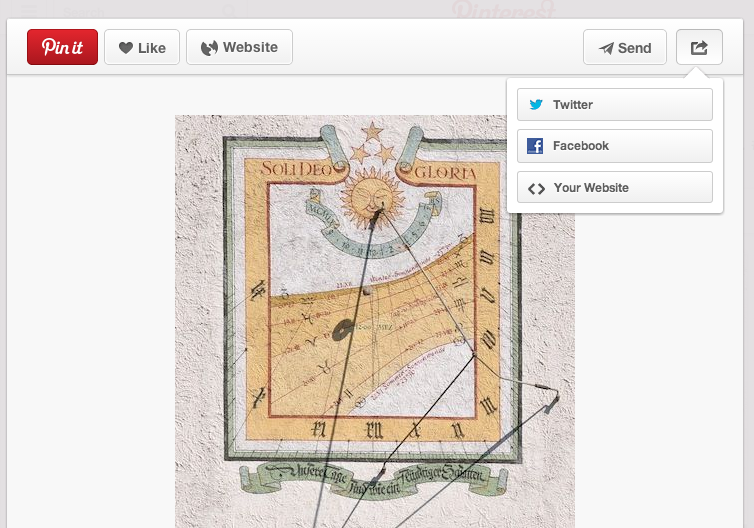 Here is what I have so far: Latin Sundials at Pinterest. 3. I also learned how to create widgets for individual pins! That is something new for me. You can see those in the sidebar of my Janux History of Science blog, and I've pinned one here below as an example. My plan for the blog is to have two pins in the sidebar from my two most recent blog posts. So, as I add a new post, I'll move the top pin down in the sidebar and add the new pin up top. It takes just a moment to do; you just go to a pin, click on Share, choose Your Website, and then grab the embed code. You only need the actual js script once on a page; after that, you can just grab the data line. Very impressive: I love widgets! Unexpectedly, it looks like a good portion of my free time this semester will be taken up with a really terrible digital tool, Janux, the new (and VERY expensive!) MOOC software platform that my school has built. There is a course I really really REALLY want to take, but the terrible software is making me regret my decision to commit to the course. But I am committed, and I will see it through. I'll post an update once a week here about how the tool is working ... or, rather, not working. This will definitely cut back on my Digital Tools postings, but I will make sure to post about Janux as a kind of round-up of my latest (mis)adventures. Of course I created a blog to get started, since I have to have a blog for any project I am doing. How would I keep track of things without a blog? VIDEO NOTES: I am recording my notes for the course videos in my blog. I would never trust my notes to this buggy software platform (as it wants me to do), nor do I see any value at all at keeping my notes private. So, I'm posting them in my blog. I just wish I could embed the videos that go with them. It may be possible to do that, but I am doubtful. Waiting to find out. EMAIL: Since the instructor of the course is a fantastic communicator with many years of online teaching experience (he and I started out teaching online at the same time! ), I am recording my thoughts about his emails here since I know I will get some good ideas for communicating with my own students. His emails are the best by far from any instructor of any MOOC I have taken. DIARY: This is where I am posting documentation about my frustrations with the system, software troubleshooting, etc. It is just depressing, but by including screenshots and other details, I hope I can make it useful for the Janux developers. So far, every one of my Janux sessions has ended up abruptly in complete frustration, not what I would expect from a platform for which there is an annual budget of almost a million dollars and which was supposedly tested with actual courses last fall. Sigh. So, I'll have more to say in future weekly round-ups here, but it was useful to spell out my plan. Plus, I will be learning some more things about using Blogger here which should help me get some good ideas for how I can encourage my students to start using Blogger next fall in my classes. There is a lot of overlap between what I am doing for Kerry's course and what my own students do, and no surprise: Kerry and I first built our courses together, and we had so much good back-and-forth as we did that! My whole approach to revision and the project calendar, for example, all comes from Kerry's insights then. My absolute #1 goal is to get them to open up the video content for the course so that it can be shared and embedded elsewhere; right now, only the promo video is at YouTube. You can get a sense from just this video of how fabulous Kerry is and what a great course he has created. 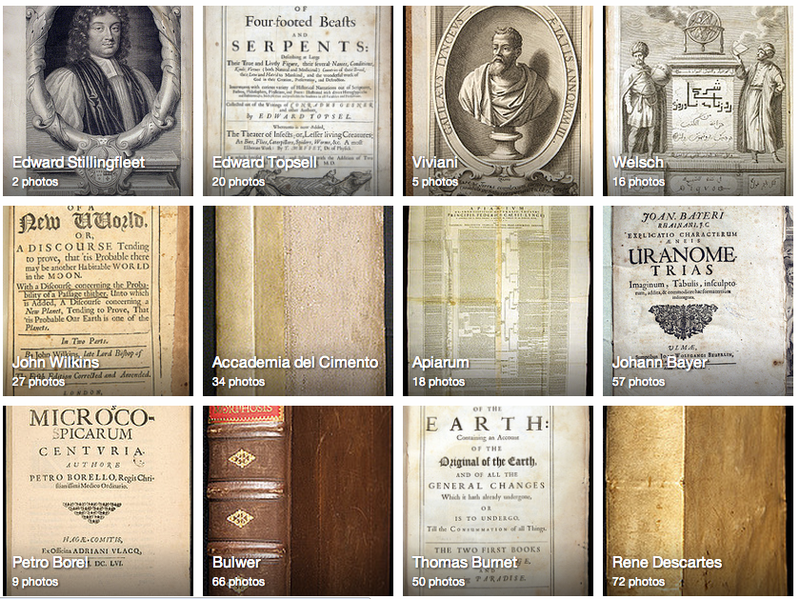 I am pretty sure he would want to share the videos as widely as possible given all that he has done to make the History of Science Collections available to all — just look at this OU History of Science Collections Flickr stream for example! Wow! That's the kind of sharing I would to see for the videos too. Fingers crossed... maybe I will have good news about that next week. I'm not sure how often I'll be able to post in this blog as the semester gets started, but I had to look up a tip to remind myself how to do something at Twitter today - adding myself to my own Twitter list - so I thought I would write up a note here so that next time I'll know what I'm doing. Log in at Tweetdeck, and then click the Lists button (near the bottom of the left-hand sidebar). Click on the list you want to work on, and then click the Edit button. Put your own Twitter handle into the search box, and then when you see your profile pop up in the left-hand sidebar, click on the plus button. That's it! Easy-peasy. I learned about this add Townsville Social Media - for screenshots and more details, see their helpful post: How to add yourself to a Twitter List you created. 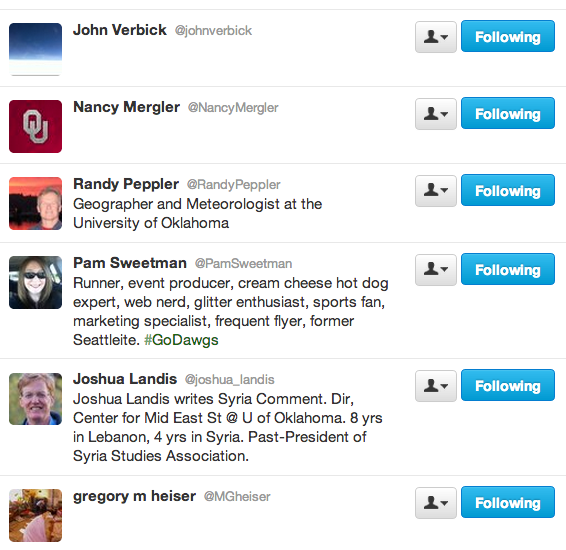 And here's my current list of University of Oklahoma faculty and staff that I've found at Twitter. 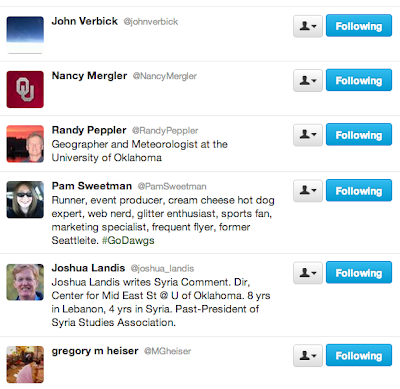 I was able to add some new people thanks to the Tech Expo's Twitter backchannel on Friday. Whoo-hoo! The weekend is here, school starts officially on Monday, and it's pouring rain outside: I would say those are three good reasons to get back into the habit of writing some blog posts here about the technology I use in my online classes. And for this posts, wow, I have big news to share about one of my most valued tools: Ning. I discovered recently that this will be my last semester using the Ning as my virtual classroom (for student blogs, discussions), which is both a sad and exciting discovery to have made. I like the Ning so much that I never would have made the choice to leave it on my own but, as with so much software, the decision is being made for me: Ning is transitioning to a new version, Ning 3.0, and the legacy mini-Nings (a holdover from its foray into the education market and a partnership with Pearson some years ago) will not transition with the other communities. Ning has promised 12 months for communities to make the transition, which means I won't have any trouble making it till the next of the semester, and I might squeak by in the fall semester also, but for a change as big as this, I will need to devote a considerable part of my summer to working on it. So, as a result, this will be my last semester with the Ning, and I am 99% certain that the students will be using Blogger blogs starting next fall. Blogger is my own blogging platform of choice so I know I can give the students good support and encouragement based on my own experience, plus I am enormously inspired by all the work I see Gideon Burton and his students are doing with Blogger as their shared platform (for example, the new "Literature of Awe" course blog). I could, of course, transition to a real Ning and use their 3.0 platform. But that would cost me $25/month (as opposed to the $20/year I currently spend), and I really cannot justify that cost. If my university assumed the cost, I would gladly stay with Ning since it has some enormous advantages as a community space for online students. My university, however, has no interest in this kind of thing. I'll save those complaints for a separate post. Suffice to say, the microscopic amount of social capital I have accumulated at my school would not be well spent in trying to get my school to support a Ning community for my online classes. Plus, I know that it is time to move on. Ning has some advantages, but it has some real disadvantages also. In particular, I no longer see any need to use a closed community. When I first started using Ning for my classes, which was back in 2008, the world of social networking was still something relatively new and the idea that students positively needed to learn how to use social networking tools as part of their education was really not something that crossed my mind. Now, however, in 2014, it seems to me very important for students to know how to use the kinds of tools that they will help them to build their professional presence by networking with others online. This is something badly neglected at my school, which seems to put a higher priority on promoting Internet FUD (fear-uncertainty-doubt), encouraging students to try to "cover their tracks" online, keeping things private, rather than helping them learn to make a distinction between private and public so that they can decide just which things they can, and should, share as they begin to build a professional identity online. So, I am not worried, as I once was, about using public tools, provided that the students have the option of including their name, or not, on their web publications, just as they make that same choice for the websites that they build for their class projects. What I am going to lose, though, is the nicely integrated "feel" of the Ning, where all the blogs come together in a single shared webspace, with the newest blog posts appearing on the homepage of our Ning site. I use a single site for all my classes, which gives it a really exciting look as the images being used by Myth-Folklore students in their blog posts appear side-by-side with posts from students in the Indian Epics. It's a really stimulating and thought-provoking space in which to ask students to spend their time (unlike, UGH, Desire2Learn). When I go to the Ning and take a look, it just makes me feel good. I'm able to have that space with zero effort on my part; I have written a few widgets for the sidebars of the Ning, but for the actual site design, I've been happily able to use a Ning template without modification. Now, as I contemplate leaving that behind, I will have to think about how I, on my own, can get that sense of a lively, shared group space. If not a portal, then one really good aggregator page. My current thinking - but luckily I have some months to think about this before summer comes - is to go with individual Blogger blogs for the students (which has the enormous advantage of putting them in control of their own blog, which I like very much) while I figure out some creative use of RSS to bring together the latest posts in some way that is both useful and visually attractive. I'm not a programmer or even a tinkerer on the level of someone like Alan Levine or Stephen Downes to come up with something really sophisticated like the wonderful ds106 website, for example, but I am guessing that with some hard work over the summer I can build some kind of aggregator that will suit my needs, creating a simple single landing page to bring together the flow of student activity that I would like to see as a kind of "window" into the work we are doing together as a class. I love RSS as a technology (even though it may be dying a slow death, I know, I know), and the time I would invest in learning more about RSS and aggregators would, I think, be time well spent and very enjoyable, too. And, since I am deep down a lazy soul who likes to find shortcuts for things, I am also thinking I might be able to use a software product like Feedly or Flipboard to provide the solution I am looking for. At Google+ someone told me that Feedly has something in the works like the old Google Reader bundles (eegad, how I loved Google Reader bundles! I still miss them! ), and that indeed might solve my problem for me. Moreover, I will really welcome the opportunity to encourage the students to feel like owners of their blogs in the same way that they are the owners of the Google Sites that they build for their class projects. Even if I am not able to come up with a good solution for the "group space" that I have enjoyed so much with the Ning, I am sure I could make this work even if the blogs are free-standing, with students going from blog to blog using links that I provide in the same way that I now provide links to their Ning blogs and, for some assignments, their Ning posts. I will have the advantage of Blogger RSS and Blogger labels to build on (RSS and labels being poorly implemented in Ning, it's true), so I really don't have any doubts about being able to come up with a workable solution for fall that will offer all kinds of great advantages compared to what I am doing now with the Ning. So, while I am very sad to see my Ning days come to an end, I am very excited about what I will do next. It's been fabulous run with the Ning, and I have no complaints about it - it's been a great tool for me and for my students, and I think it is more of an indictment of the education culture in this country rather than Ning itself that Ning's foray into the education market did not turn out to be profitable for them. I wish them well in their future growth, and I will always be grateful for the six years during which I had the pleasure of using Ning as the social platform for my classes!